For decades the elegant Fifth Avenue Hotel at Fifth Avenue and 23rd Street attracted princes and politicians, moguls and millionaires. 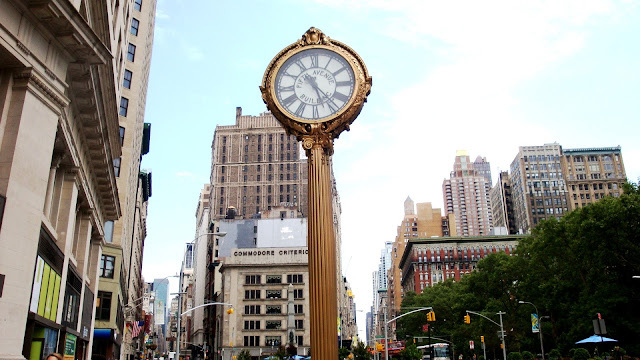 Directly in front of its entrance a tall sidewalk clock conveniently told the time to passing businessmen and nannies pushing baby carriages to Madison Square across the avenue. But, as was common practice, when the Fifth Avenue Hotel left in 1908, the clock went too. The builders of the Fifth Avenue Building that replaced the hotel at 200 Fifth Avenue wasted no time in erecting a new clock. 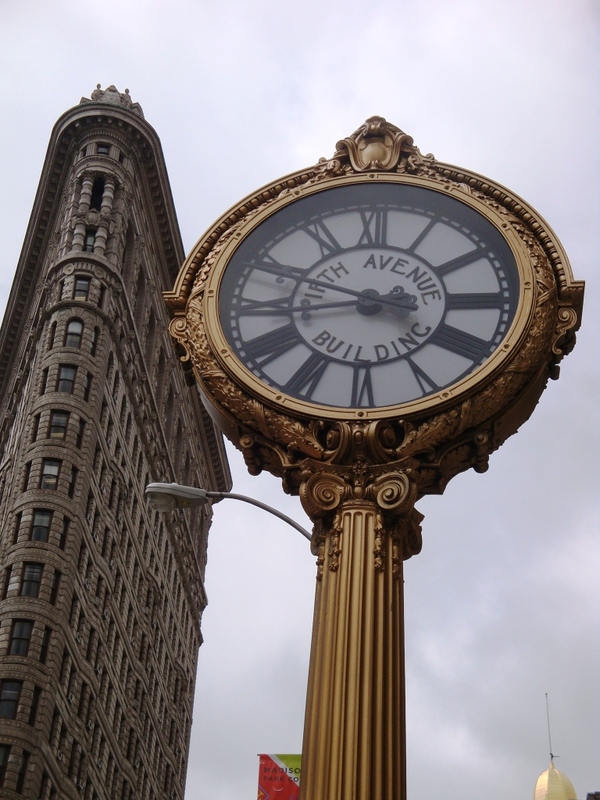 In the busy neighborhood anchored by the relatively new Flatiron Building across 23rd Street to the south, a street clock was considered essential. The clocks served several purposes. Not only were they a convenience for the neighboring shoppers and businessmen, they drew attention to the store or building and provided excellent advertisement. Desiring their clock to be in keeping with the high tone of their new office building, the owners commissioned the esteemed Brooklyn firm of Hecla Iron Works to produce their clock case. Hecka (named after an active volcano in Iceland) had produced the 133 cast iron subway kiosks as well as important cast iron building facades like the B. Altman & Co. Department Store on 6th Avenue and the New York Life Insurance Building. Of the many street clocks on the sidewalks of Manhattan, this one stood out. Installed in 1909 it was one of the most ornate in the city. It sits on a rectangular base with classical ornamentation, a fluted Ionic column rising to a capital inspired by the work of 16th Century Venetian architect Vioncenzo Scamozzi. 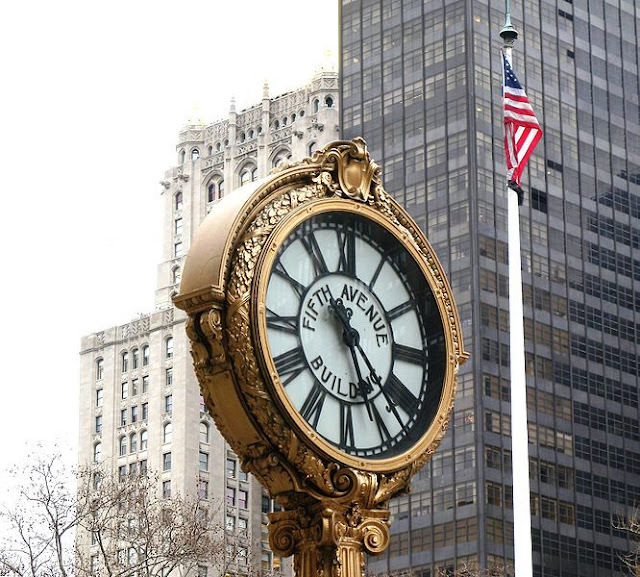 The two large dials which advertised Fifth Avenue Building are encircled by oak leaf wreaths. To make the cast iron clock even more a work of art, it was then gilded. The clock was wound about every eight days; a weight within the column slowly descending the full length. More recently, the mechanism was replaced with an automatic one. 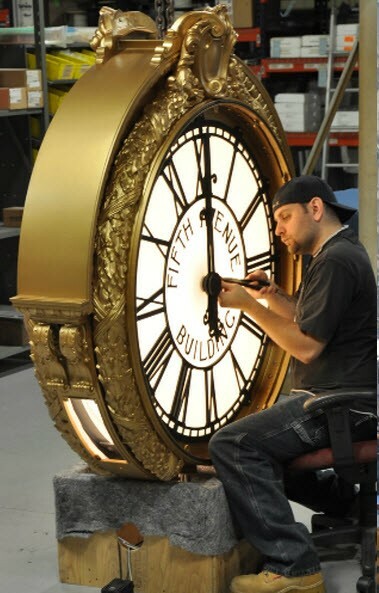 In 2011 the clock was completely restored by the Electric Time Company, Inc. of Medfield, Massachusetts. The eight-month restoration was sponsored by Tiffany & Co.
A technician works on the eight-month restoration of the Fifth Avenue street clock in 2011 -- photo courtesy Electric Time Company, Inc. Thank you for your great post, Tom! I meant to write to you over a year ago... I was looking for information on the clock and luckily, your site came up high in the search results.